Approximately 300 people and over 50 sponsoring organizations gathered for the sixth annual event in Madison to hear a diverse set of perspectives on the growing clean energy economy, from military leaders and farm cooperatives to utility executives and solar developers. “This has been a great year for renewable energy in Wisconsin, with the most solar installed ever, increased attention on biogas and a new wind farm under construction. We’re really pleased that the Summit reflects that excitement,” said Executive Director Tyler Huebner. Keynote speaker Barbara Nick, CEO of Dairyland Power Cooperative, kicked off the speakers, explaining that the cooperative’s recent large investments in wind and solar will allow it to decrease its reliance on coal. "With or without the Clean Power Plan, with or without regulation, we have a strategy that we will diversify because it's just plain good common business sense," Nick said. On the morning panel, Amy Heart, director of public policy at SunRun, led a discussion about the economic and security benefits of mainstream clean energy. Department of Defense Engineer Gregg Herman explained what the US Army Reserve is doing to meet the DoD’s ambitious renewable energy goals, including building a 125 kilowatt solar array in Milwaukee. Larry Ward, executive director of the Michigan Conservative Energy Forum, spoke about his experience working with GOP lawmakers to pass a bill raising the state’s renewable portfolio standard and expanding energy efficiency. The energy independence and job creation benefits that clean energy brings align well with conservative principles, Ward said. advantage of solar energy. Photo credit: Organic Valley. Stanley Minnick, energy services manager for Organic Valley, the nation’s largest organic farm cooperative, highlighted how incorporating renewable energy into family farm practices makes them more financially sustainable. 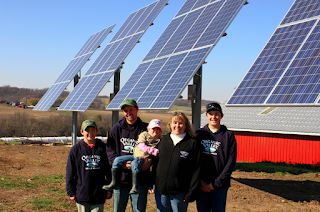 “Having solar on their farms makes it more likely that a son or daughter will be able to take over the farm from their parents,” Minnick said. He pointed out that renewable energy jobs are living-wage jobs that can really make a difference for families. “This industry has changed my life and my family’s lives.” For more information on Organic Valley’s renewable energy efforts, see our blog. 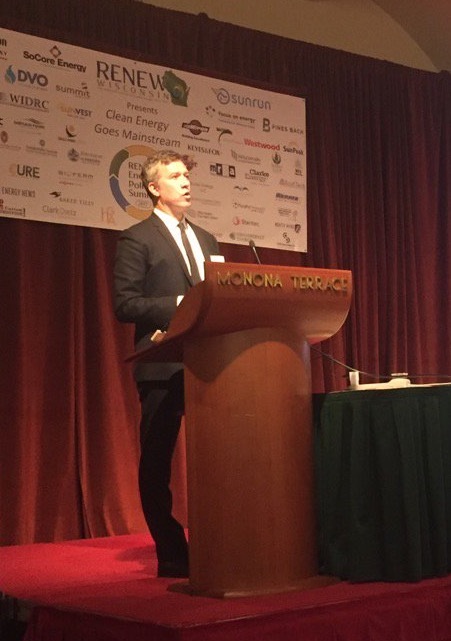 Adam Browning, a national leader on solar policy and executive director of Vote Solar, gave the afternoon’s keynote address, following recognition of some of Wisconsin’s best renewable energy installations of 2016. Browning highlighted some of the bright spots in Wisconsin’s solar market, like Dairyland Power’s innovative model that allows its member cooperatives to piggyback on utility-scale solar developments as a way to offer cost-effective shared solar programs to their customers. “I wish we had that in California,” he said. Browning pointed to state policy as a critical driver for solar growth, in addition to efforts by industry leaders such as Apple, Facebook and Google who have all committed to using 100% renewable energy. These corporate renewable energy policies will produce downstream opportunities and benefits for individual families too: “what’s good for the Google is good for the gander,” he joked. 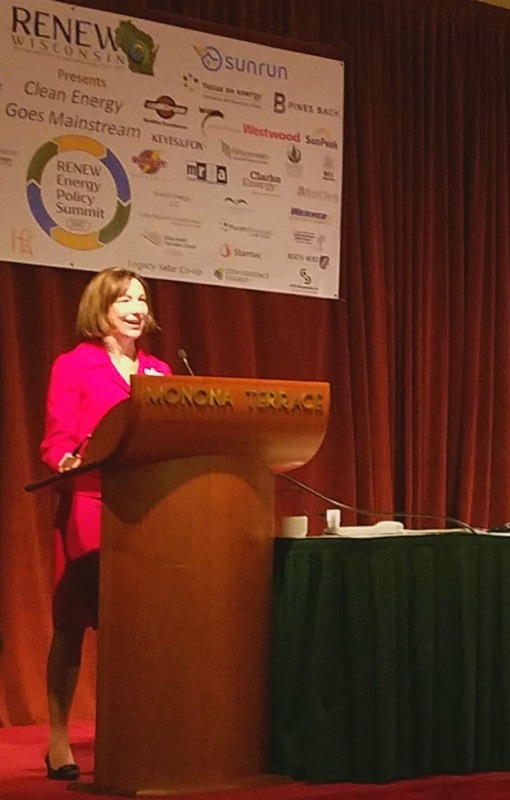 The afternoon presentations concluded with a panel discussion featuring Laura Caspari, of SoCore Energy, Jeanne Hoffman of the City of Madison, Jeff Ripp of the Wisconsin Public Service Commission, and Teran Smith of EDP Renewables. SoCore Energy is building 14 solar arrays in Wisconsin for Dairyland Power, while EDP Renewables is responsible for the new Quilt Block Wind Farm being built in southwest Wisconsin, the state's first wind farm development since 2011. Ripp highlighted Wisconsin's $20 million RFP for new biogas initiatives, while Hoffman pointed to Madison’s recent efforts on solar, as well as a new 100% renewable energy resolution.